Did you know 42% of people have either dated someone they work with? Soapland is a breeding ground for good looking people so they’re bound to fancy one another. Some soap stars have even married one another, remember when Tina O’Brien and Ryan Thomas were together? This couple got together on and off screen. James joined the show during a break from playing Paul McQueen in Hollyoaks in 2009 but it wasn’t to be with these two. They split a year after meeting. A source told The Sun, “Sammy and James seemed perfect for each other. Everyone thought they would go the distance and some people still think they could get back together. “They are a strikingly gorgeous couple and the chemistry you saw on screen was there in real life, too. James moved onto Corrie’s Catherine Tyldesley but things didn’t last long and Catherine dumped him for being “too immature” and “still hung up on Sammy”. Oooooops! He’s a bit unlucky in love, isn’t he! 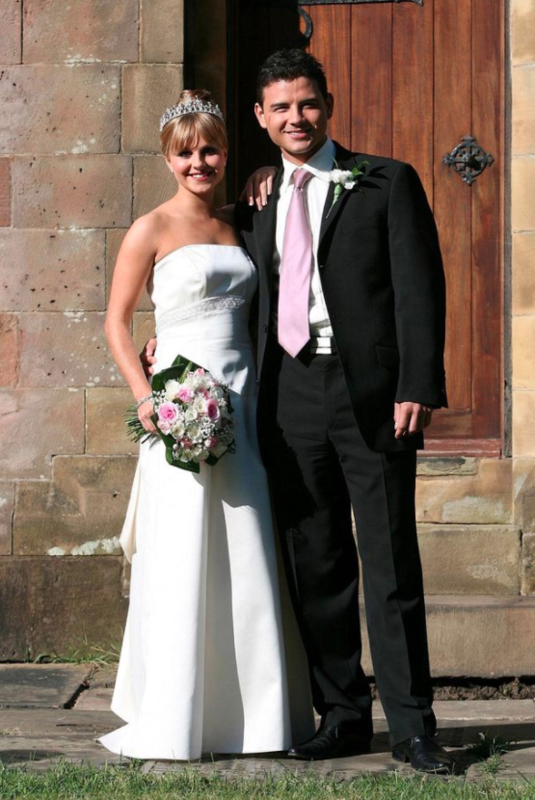 Tina O’Brien (Sarah) was actually dating Jason’s brother Todd Grimshaw in the soap before she found out he was gay and she married Jason instead back in 2007. The pair had been together since 2003 in real life just after she’d ended a year-long romance with Bruno (Todd Grimshaw). It was all very confusing if you ask me. “It was five months later when I got together with Ryan and I was worried about it as he’s a friend of Bruno. But we worked hard to make sure there wasn’t any tension between the three of us,” she told The Mirror in 2007. “Ryan and me are for keeps. I think we’ll be together for ever, fingers crossed. I don’t see myself with anyone else,” she continued. Things weren’t meant to be for the couple thought. Tina left the soap the same year to have their daughter Scarlett and claimed that Ryan talked her out of returning to the soap before dumping her the week before their daughter’s first birthday. “He said he didn’t love me any more,” she told new! magazine. “He said I didn’t do it for him any more. Those were his words. I was absolutely devastated. He said he didn’t want the responsibility of a relationship with me. “Ryan can be a very loving and nice guy, but he can also be laddy. He was keen to go out a lot,” she said. Tina said she begged him to change his mind but he didn’t want to fix things and that was that.